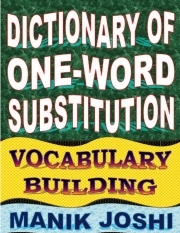 Description of "Dictionary of One-word Substitution (eBook)"
Reviews of "Dictionary of One-word Substitution (eBook)"
If you want to improve your performance in various competitive examination then you must buy this book. One word-substitutes have been grouped according to categories and thus very easy to learn. Moreover,this book is also very useful for improving your vocabulary. A Great Book on One-word Substitutes.